The devil’s in the details. Diablo 3 Eternal Collection, which packages together the base game, the extensive Reaper of Souls add-on, plus the Rise of the Necromancer pack which adds a whole new class, is now available on Nintendo Switch for £32.99 through Amazon. You’re looking at dozens upon dozens of hours of addictive dungeon crawler gameplay. It’s a hell of a bargain and fits in snugly alongside our best Cyber Monday game deals. Of course, with this being the Switch, you get the added bonus of taking the incredibly compulsive gameplay loop that Diablo 3 throws at you and taking it anywhere. Want to battle demons on your daily commute? Sure, why not. Fancy flinging fireballs at Satan’s finest before a trip to the dentist? Nothing is stopping you. Then, when you get back, you can do it all over again. If you’re not versed in the series, firstly, where have you been? And, secondly, welcome! Diablo offers up an isometric RPG experience skilfully disguised as a hack-and-slash loot ‘em up. Yes, I just made that genre up, but it’s surprisingly close to the unique experience presented by Diablo. You can also play local co-op on your Switch with three other friends. Need an extra Nintendo flavour? Ganondorf's armour is available in-game, as well as a Cucco companion pet to accompany throughout your travels. Don’t forget, too, that this is the bumper edition. 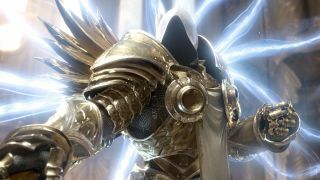 The Diablo 3 base game on its own is great enough but, with the Reaper of Souls DLC, you get to battle an Angel of Death as he tries to bring about the end of the world. That's not all: in Rise of the Necromancer, you can raise the dead on a whim and get the legions of skeletons and lost souls to attack your foes. You’re basically the Night King with better fashion sense. What’s not to like?